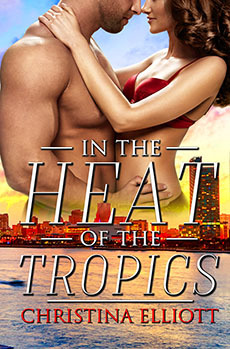 It’s a sweltering Miami summer, and a serial killer has returned to haunt the city. Ambitious Tribune reporter Ingrid Sorenson is assigned to cover the story and her primary source is brusque homicide detective Rick Gonzalez. The pair spar as Ingrid wants more details for her big story, while Rick seeks to keep her at bay. Their clashes, however, also ignite sparks of passion. Breaking all professional rules, they risk their careers to give in to mutual desire. But as tension ratchets up over the murderer’s increasing body count, renewed mistrust of each other’s motives wedges them apart. Is Ingrid using Rick to gain bigger headlines? Is Rick carrying out a long held grudge against journalists? Then as a raging tropical storm breaks, Ingrid gets a tip that leads her straight to the crazed killer’s lair. She and Rick must choose between saving themselves or rescuing their love. Miami in the summer was like swimming in blood, thick, warm, sticky. At eighty-five percent humidity or more, the air became tangible matter, a languid mass that landed in April and didn’t budge until October. It was the kind of oppressive heat that crazed people, Ingrid thought, pushed them to the boundary of normalcy and sometimes shoved them over. That made for good news stories, the kind that could make a reporter’s career. She quickened her pace across the parking lot to the shabby cargo terminal on the shore of the Miami River where the police chief’s press conference was due to take place in ten minutes. A guy wearing a crisp white guayabera shirt stood at the warehouse door, juggling armfuls of folded easels and poster boards as he tried to free a hand to grab the handle. The pouch that hung on a chain over his tropical loose Latin shirt identified him as a cop, although he wore his hair longer than most, past his collar. “I’ll get it.” Ingrid reached for the door. “Thanks.” He gave her a generous smile, lighting up his smooth features. She returned it as she gestured for him to enter ahead of her. He held her gaze for just a smidgen of a second longer than necessary before wheeling through. Or was it her imagination? Wiping the thought from her mind along with the cobweb of perspiration from her upper lip, she trailed him in, eagerly anticipating the blast of manufactured cold air. Instead, she hit a wall of suffocating heat that made her reel slightly. No AC. Several fans labored to create a breeze, but simply swirled around cooked air. Dark patches marked the shirt backs of the TV cameramen as they wired up their microphones in a bouquet at the empty podium. The TV lights, Ingrid knew from experience, would make the heat worse for the police chief and whoever else would be doing the grandstanding. That meant it would be a short press conference, which was just as well. Ingrid had already been shutting down her computer to go home when Marlena, her editor, dispatched her to the chief’s announcement about a massive drug haul. Ingrid didn’t normally cover cops, but the downtown police reporter was wrapping up an investigative project running that weekend. She didn’t mind. Crime was far more exciting than the school boards and municipal councils of her suburban beat. And it was a decent story. The Miami River had been a major narcotrafficking conduit in the city’s cocaine-cowboy eighties. Now, a quarter of a century after law enforcement had chased out the cartels, this bust showed that a new generation of traffickers had rediscovered the waterway as a route into the lucrative US market. Maybe she could pitch a Sunday feature with that angle. Features were the way to stand out at the Miami Star. The cop she’d opened the door for was setting up the easels behind the podium, placing on them the poster boards showing the typically dour mugshots of the arrested suspects. He must be one of the detectives involved in the bust. To the right of the podium a long table held a pyramid of plastic-wrapped cocaine bricks, three AR-15 assault rifles, and neatly arrayed wads of cash. The bust booty, the must-have visual. Ingrid took out her smartphone. She’d get the photos and video before the TV guys elbowed her out of the way, or before she fainted from heat, whichever came first. “People, if you don’t mind. Let’s get this rolling. We know it’s hot. The sooner we get this done, we can get out of here.” It was the Miami PD spokeswoman, Major Cecilia Montoya. “Why aren’t you doing this downtown?” called one of the TV reporters as he wrenched his tie loose from his collar. “Because we’re doing it here,” Montoya snapped. A stream of sweat from the TV reporter’s temple had carved a canyon through his pancake makeup, Ingrid noted, not without some glee. The TV people were always insufferable egotists, treating print reporters like second-class journalists when in fact, the first thing that TV station assignment editors did every morning was scour the newspapers to piggyback on their stories. Chief Horacio Quintanilla, his complexion a deeper florid tone than usual, gave his forehead a last swipe and stuffed his handkerchief into a pocket as he stepped out of the crowd of blue and took over the podium. The cameramen scrambled to assume their positions. It was too late now for Ingrid to worm her way into a spot in front of the podium amid the wall of equipment. She was left with a side view of the chief, which included the cops on the sidelines, but not the suspects’ photos. She’d have to get them afterward. She aimed her smartphone and pressed record as the chief started speaking. The chief droned on, his forehead glistening under the lights. That same cop was standing off to the side, his hands clasped in front of him. He was maybe thirty, tar-black hair brushed straight back Latin-style. He seemed to be staring at her. She dismissed the thought. She was simply in his sightline. Montoya leaned into the microphones. “We’ll take just a couple questions. The chief has another event to get to,” she announced. The chief was again mopping his face. “Not at all. Obviously, drug traffickers are growing increasingly sophisticated in their smuggling methods, but we’re on top of them,” Quintanilla said. The chief’s face pulled into a frown. “It would be premature and rash to leap to that conclusion. We’re exploring all avenues in our investigation.” The usual cop-speak, talking but saying nothing. A serial killer? That was interesting. Feeling perspiration dribble uncomfortably down the gully of her spine, Ingrid snapped a couple photos of the mugshots and strode to the door. She needed air. To her surprise, the cop she’d been eyeing was standing sentry at the exit. Smiling, he pushed open the door to reveal the gray veil of twilight. “Allow me this time,” he said. Their eyes fused for an instant, and then Ingrid walked on to her car, feeling a tangle of confusion. What was that all about? Had he been trying to flirt with her? Dammit. She should have tried to chitchat. Then again, she didn’t have time. She was hard up against her deadline. She got in her car and started the engine. She should’ve given him her card. That would’ve solved the impasse in a way that was professional, yet an invitation for him to contact her if he wanted. Crap. She always messed these situations up. Well, it was too late now. She gunned it back to the Star’s West Miami bureau, writing the story in her head to push the cop out of her mind. Three hours later, Ingrid was lounging in shorts and a T-shirt in the air-conditioned Florida room of her bungalow, absorbed in a rerun of “Downton Abbey,” her comfort TV show, when her phone rang. The desk. Likely a question about her story. She grabbed her notebook, ready to refer to it. “We got a problem,” barked Mel, the night editor. “Save it for Marlena. That’s what day editors get paid the big bucks for.” He hung up. Ingrid tossed the phone onto the couch, recalling the press conference. There’d been a bunch of cops, all fuzzily gray in the shadows cast by the TV lights. Her stomach lurching, she played the video on her phone. The cop she’d spoken to was the only one who stood out, especially in that dazzling white shirt. Thank God she hadn’t given him her business card.